Although Yahoo's most severe data breach apparently involved more accounts than Collection #1, this new major security incident involves almost 2.7 billion records, including almost 773 million unique email addresses alongside passwords associated with those addresses on various breached services. If you were thinking that your email address and personal passwords were confidential, you might want to rethink it. The latest major data breach that was discovered earlier this month is large enough to make the big security issue that Quora had to face recently look like a joke. 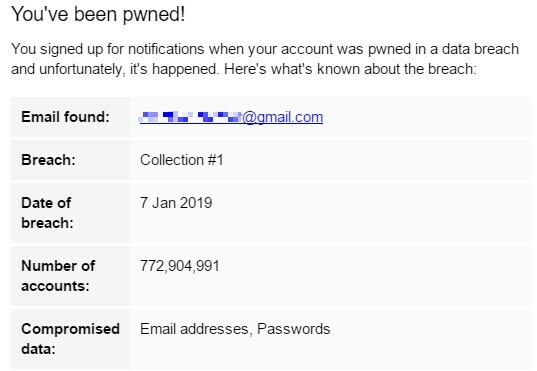 Simply known as "Collection #1," this breach most likely involves at least one of your accounts so you'd better check if you were pwned or not. 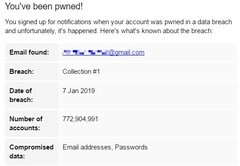 The email that I received earlier today from the aforementioned website contains the following description for the Collection #1 breach: "In January 2019, a large collection of credential stuffing lists (combinations of email addresses and passwords used to hijack accounts on other services) was discovered being distributed on a popular hacking forum." The description continues by mentioning the key figures of this disaster: 2.7 billion records and 773 million unique email addresses. Microsoft Regional Director and MVP Troy Hunt has even more accurate numbers: the Collection #1 data set contains 2,692,818,238 rows, with 1,160,253,228 unique combinations of email addresses and passwords — 772,904,991 unique email addresses and 21,222,975 unique passwords. For more details regarding the breach and how the data was discovered, feel free to get deeper into Troy Hunt's very detailed article. If you don't care much about the technical stuff and only want to know if your accounts and passwords are safe, just go to Have I Been Pwned (the link is at the end of the first paragraph) and check for yourself. So... have you been pwned or not? As usual, don't be shy and drop a comment below. I will be there to join the discussion as soon as I'm done changing passwords.